Seaquest Performance is a one stop marine experience offering sales of boats,motors,trailers, chandlery, lubricants, and service to all inboards, and outboard engines. We even have our own in house fiberglass shop. You can get expert advice on product, boat set up, boat handling, and propeller tuning. We do everything from basic boat fit outs to custom Mercury 1350 QC4V top end fit outs. 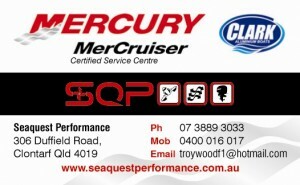 Seaquest Performance has Mercury/Mercruiser certified mechanics, an also have an repower specialist. Seaquest Performance offers high quality products such as Fusion, Humminbird, Minn Kota, Permatrim, and BLA products and also carry Clark Aluminium Boats, and Oceanic Trailers. Seaquest Performance is very driven to offering the boating public the highest of quality of service, and products to their customers. All of our staff are very skilled, experienced and qualified in their fields. Seaquest Performance is based in Clontarf twenty min. away from Brisbane City. We also offer a call out service to where the customers boat is located. Seaquest Performance also is a Insurance agent for Club Marine, and also offer United Financial Services to our customers. Seaquest Performance is a successful sales and service business operating now for eight years.